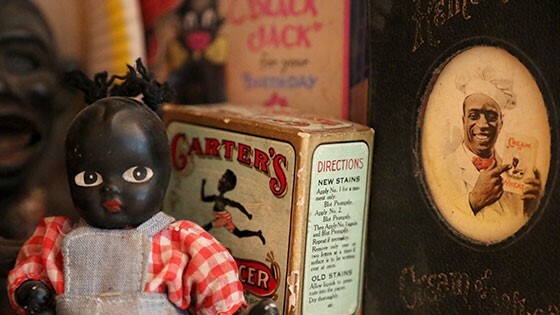 BLACK MEMORABILIA follows the propagation of demeaning representations of African Americans. Our modern, global economy connects disparate individuals in unexpected ways. From industrial China to the rural American South to contemporary Brooklyn, people reproduce, consume, and reclaim black memorabilia. Chico Colvard’s feature documentary confronts the incendiary features of racialized artifacts head on, calling into question who gets to tell what stories, and why. In the midst of the roiling ethnic unrest in the US today, BLACK MEMORABILIA strikes at the heart of a pressing contemporary issue and opens a unique dialogue about the continuing legacy of racism in America. Colvard shines a light on whether it is possible to escape race—in the most positive sense of the term—while thoroughly investigating an alternative pathway toward racial reconciliation.